CBI - China: Day 26 of 154 of the Japanese Invasion of Manchuria. Spain: Day 89 of 985 of the Spanish Civil War. Germany: Hitler pledges to respect the neutrality and territorial integrity of Belgium. Spain: Day 454 of 985 of the Spanish Civil War. CBI - China: Day 99 of 2,987 of the 2nd Sino-Japanese War. Day 62 of 106 of the 2nd Battle of Shanghai. Day 43 of 70 of the Battle of Taiyuan. Spain: Day 819 of 985 of the Spanish Civil War. CBI - China: Day 464 of 2,987 of the 2nd Sino-Japanese War. Day 125 of 139 of the Battle of Wuhan. Day 2 of 81 of Japan's Operation GUANGDONG. CBI - China: Day 829 of 2,987 of the 2nd Sino-Japanese War. ETO - UK: Day 38 of 258 of the Blitz. ETO - UK: Day 96 of 114 of the Battle of Britain. East Africa: Day 126 of 537 of Italy's East African campaign in the lands south of Egypt. CBI - China: Day 1,195 of 2,987 of the 2nd Sino-Japanese War. Day 334 of 381 of the Battle of South Guangxi. CBI - Thailand: Day 13 of 221 of the Franco-Thai War (Vichy France vs Thailand). Russian Front - Finland: Day 107 of 142 of Operation SILVER FOX, a joint German-Finnish campaign to capture the Russian port of Murmansk in the Arctic. Russian Front - Finland: Day 105 of 140 of Operation ARCTIC FOX, a joint German-Finnish campaign against Soviet Northern Front defenses at Salla, Finland. Russian Front - Finland: Day 114 of 164 of the Battle of Hanko. The Soviets will be forced off their leased naval base. Russian Front: Day 114 of 167 of Germany's Operation BARBAROSSA. Russian Front - North: Day 36 of 872 of the Siege of Leningrad. Russian Front - Center: Day 12 of 98 of the Battle of Moscow. German Army Group Centre captures Kalinin, Russia. Russian Front - South: Day 67 of 70 of the Siege of Odessa, Ukraine. MTO - Libya: Day 187 of 256 of the Siege of Tobruk. East Africa: Day 491 of 537 of Italy's East African campaign in the lands south of Egypt. CBI - China: Day 1,560 of 2,987 of the 2nd Sino-Japanese War. Russian Front - North: Day 401 of 872 of the Siege of Leningrad. Russian Front - North: Day 162 of 658 of the Siege of the Kholm Pocket, USSR lays siege to the Kholm Pocket but the Germans hold out for a about a year and a half. Russian Front - South: Day 108 of 150 of Germany's CASE BLUE, the failed offensive to take the Caucasus oil fields. Russian Front - South: Day 52 of 165 of the Battle of Stalingrad, bloodiest battle in human history. MTO - Egypt: US P-40s fly a fighter sweep west of El Alamein. East Africa: Day 162 of 186 of the Battle of Madagascar. CBI - China: Day 1,925 of 2,987 of the 2nd Sino-Japanese War. PTO - Alaska: Day 129 of 435 of the Battle of Kiska, Aleutian Islands. The US and Canada will defeat the Japanese invaders. PTO - Malaya: Day 237 of 357 of the Battle of Timor Island, a long guerrilla war ending in Japanese victory. PTO - New Guinea: Day 85 of 119 of the Battle of the Kokoda Track. The Australians continue pushing back the Japanese troops. PTO - Solomon Islands: Day 68 of 187 of the Battle of Guadalcanal. US 164th Infantry Regiment lands on Guadalcanal. 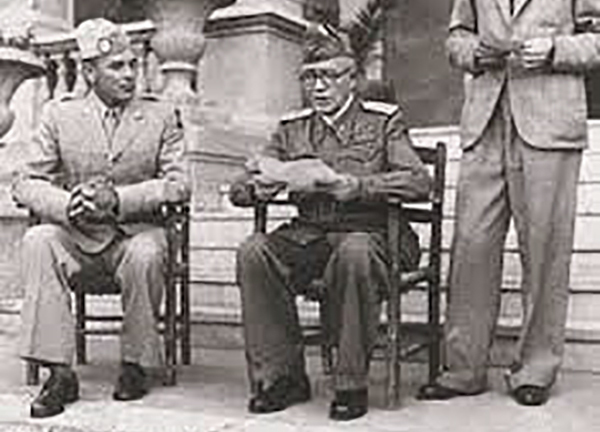 MTO - Italy: One month after the surrender of Italy's army, Italian Prime Minister Pietro Badoglio declares war on Germany, its former Axis partner, and joins the battle on the side of the Allies. With Mussolini deposed from power and the collapse of his fascist government in July, Gen Pietro Badoglio, Mussolini's former chief of staff and the man who had assumed power in Il Duce's stead by request of King Victor Emanuel, began negotiating with General Eisenhower regarding a conditional surrender of Italy to the Allies. It became a fact on 08 Sep 43 with the new Italian government allowing the Allies to land in Salerno, in southern Italy, in its quest to beat the Germans back up the peninsula. On the day of Italy's surrender, Hitler launched Operation AXIS, the occupation of Italy. They began taking all Italian troops prisoner within the areas in which they were stationed. Any and all Italians that resisted were slaughtered. One of the goals of Operation AXIS was to keep Italian navy vessels out of the hands of the Allies. The new Badoglio government had wished to merely stop fighting, but Germany's actions made that an impossibility. On this day, Badoglio announced that Italy would continue fighting, but now on the side of the Allies. The Allied operation to capture Rome from the Germans was extremely slow going. But when it was finally over, and Rome was once again free, General Badoglio would take yet one more step in freeing Italy from its fascist past - he would step down from office. Russian Front - North: Day 766 of 872 of the Siege of Leningrad. Russian Front - North: Day 527 of 658 of the Siege of the Kholm Pocket. USSR lays siege to the Kholm Pocket but the Germans hold out for a about a year and a half. Russian Front - South: Day 51 of 122 of the Battle of the Lower Dnieper River, USSR. The Russians reach Melitopol, Ukraine. MTO - Italy: The US 5th Army crosses the Volturno River. US 12th Air Force and RAF fly ground support. CBI - China: Day 2,290 of 2,987 of the 2nd Sino-Japanese War. PTO - New Guinea: Day 25 of 219 of the Battle of Shaggy Ridge. PTO - New Guinea: Day 22 of 162 of the Battle of the Huon Peninsula. Will result in an Allied victory. PTO - Solomon Islands: Allies liberate the entire New Georgia island chain. ETO - France: Day 74 of 284 of the Battle of Brittany. ETO - Belgium: Day 42 of 62 of the liberation of Belgium. ETO - Belgium: Day 12 of 38 of the Battle of the Scheldt Estuary. ETO - France: Day 29 of 236 of the Siege of Dunkirk. ETO - Germany: Day 25 of 145 of the Battle of Hürtgen Forest. Russian Front - Finland: Day 29 of 223 of the Lapland War. Finland and Russia have joined forces to kick the Germans out of Finland's most northern province. Russian Front - Finland: Day 7 of 23 of the Petsamo-Kirkenes Offensive. The Soviets will drive the Germans out of the Arctic region in northern Scandinavia. Russian Front - North: Day 30 of 41 of the Battle of Riga, Latvia. Soviets capture Riga as German Army Group North withdraws into the Kurland pocket. Russian Front - Center: Day 30 of 72 of the Battle into East Prussia and northern Poland. Russian Front - Center: Day 9 of 18 of the Battle of Memel, a border town of Lithuania and East Prussia. The Germans continue to hold the Niemen line to cover East Prussia. Russian Front - South: Day 8 of 24 of the Battle of Debrecen, Hungary. Russian Front - South: Day 30 of 72 of the Battle of Belgrade, Yugoslavia. MTO - Italy: The British 8th Army continues pushing into the Rimini area while the US 5th Army makes progress toward Bologna. RAF and US 12th Air Force provides air support. MTO: US 15th Air Force B-17s and B-24s bomb targets in Germany, Austria, Hungary and Czechoslovakia. CBI - Burma: Day 196 of 302 of the Chinese Salween Offensive in Burma. CBI - China: Day 2,656 of 2,987 of the 2nd Sino-Japanese War. Day 180 of 259 of Japan's Operation ICHI-GO. PTO - New Guinea: Day 304 of 597 of the Battle of New Britain. PTO - New Guinea: Day 175 of 481 of the Battle of Western New Guinea. PTO - Palau Islands: Day 29 of 74 of the Battle of Peleliu (Operation STALEMATE II). PTO - Palau Islands: Day 27 of 36 of the Battle of Angaur. 24 of Patty, Maxine and LaVerne's hits that made them legendary, including Boogie Woogie Bugle Boy!